Srinagar: Widely condemned when their names were first made public, the three interlocutors on Jammu and Kashmir have begun to raise hopes in the Kashmir Valley by breaking loose from official protocol. The fact that the team has been talking so frankly about the Kashmir dispute appears to signal their seriousness to crack the 63-year-old ice on Jammu and Kashmir, many here feel. The interlocutors - Dilip Padgaonkar, Radha Kumar and M.M. Ansari - arrived here Saturday. They have been interacting with people, visiting jails, calling on politicians and have also prayed for success of their mission at the holy Muslim shrine of Hazratbal. Journalist Padgaonkar, who has been doing most of the talking for the trio, has already raised the pitch for a political discourse by referring to Kashmir as "a dispute" and not using the usual guarded vocabulary of "issue" or "problem". "This is not only a departure from the usual references made by the central government and national level politicians but also marks a step forward to somewhere meet the hardline separatist leader, Syed Ali Shah Geelani, midway," Riyaz Masroor, a senior journalist, told IANS. Masroor said Padgaonkar's assertion that Pakistan had to be on board for a permanent solution indicated that the interlocutors had accepted the "international dimension" of the problem. Geelani has put forth five points for a dialogue process in Jammu and Kashmir to begin, and his first and foremost assertion has been that India should accept Kashmir as an international dispute. Home Minister P. Chidambaram said there were "no red lines" to the interlocutors' mission. "It is time to finally accept the fact that Kashmir is a dispute that must be resolved without losing further time," said Professor Muzaffar Ahmad, a college teacher. "If this mission of interlocutors fails, then the hope of peace in Kashmir could be lost forever," he said. 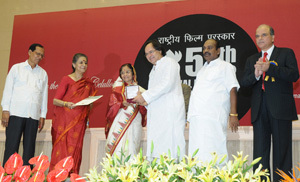 President Mrs. Pratibha Devisingh Patil presenting the Rajat Kamal Award to Farooque Sheikh for Best Supporting Actor (Film: Lahore), at the 57th National Film Awards function, in New Delhi on October 22, 2010. Union Minister for Information and Broadcasting Mrs Ambika Soni, Ministers of State for Information and Broadcasting Choudhury Mohan Jatua and Dr. S. Jagathrakshakan and the Director General (M&C) & Director, DFF S.M. Khan are also seen.